What Are My Privacy Fence Options? If you’re in the market for a privacy fence, you have a few options available. You’ve decided that you want the increased security and safety that a privacy fence can provide, but you aren’t sure where to start! From materials, to designs, to layouts, there are many different privacy fence options available to you through Hercules Fence Richmond. Board on board privacy fences are a great option for people living in close proximity to their neighbors. 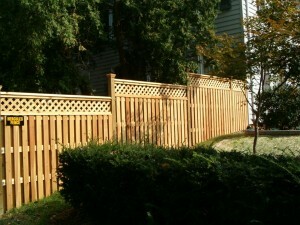 A board on board fence gives you a beautiful finished look on your side and offers the same thing to your neighbors. Even though these fences are tightly and carefully installed, you still will be able to feel gentle breezes passing through. Dogeared fences are a great way to get creative with privacy fence options and have a fence that is visually interesting in addition to being functional. Fences like these are ideal for properties that are oddly shaped, as sections can be changed and altered to fit your yards as needed. If you want the ultimate beautiful privacy fence option, lattice fences are perfect. Obviously, they are not completely private, as the top of the fence will not be solid. However, they are fantastic for those who want increased security and a beautiful place to showcase their garden. The tight pattern below gives way to a visually interesting and beautiful top, where you can put ivy or beautiful floral vines. If you want a privacy fence that offers you a little extra security, stockade fences are a good option. They have a jagged border on the top to prevent anyone from attempting to climb over them. While these fences are not as beautiful as lattice options, they are very functional for people who need extra security. Ready for a Beautiful New Privacy Fence this New Year? This entry was posted on Friday, January 13th, 2017 at 9:49 pm. Both comments and pings are currently closed.